Young men armed with machetes and sticks have entered the streets of Nigeria’s biggest city in thenortheast to target suspected Boko Haram members, even as soldiers continued an offensive against the radical fighters. The vigilante group, known as “Civilian JTF,” a play off the acronym used to describe the joint military and police taskforce in the region, started taking up arms after President Goodluck Jonathan declared a state of emergency May 14 in Adamawa, Borno and Yobe states — a territory of around 155,000 square kilometers (60,000 square miles) of the Sahel bordering Cameroon, Chad and Niger. In a nationally televised speech, Jonathan admitted the nation had lost control of some villages and towns to extremist fighters already responsible for more than 1,600 killings since 2010 alone, according to an Associated Press count. In the time since, the military claims it has killed and arrested suspected extremists as it now controls security for the region with expanded powers to arrest anyone and occupy any building. However, military officials who spoke to journalists on a recent trip through the northeast acknowledged many fighters likely fled with heavy weaponry including anti-aircraft guns and still remain a major threat to Africa’s most populous nation. The members of Civilian JTF have now come under attack from extremists for pointing out suspects to soldiers. 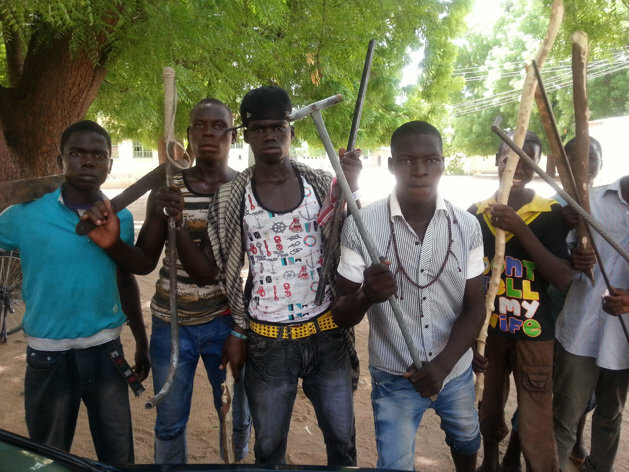 our source reporter met a group of the young men belonging to the vigilantes recently in the streets ofMaiduguri, the capital of Borno state and the spiritual home of the Boko Haram. The youths ranged in age from 17 to 25 and carried machetes, iron bars and batons to protect themselves. The men said they formed their own patrols after becoming tired of soldiers routinely rounding up any young man found in a neighborhood after an extremist attack in the city. Soldiers in Nigeria’s military, drawn from across the more than 250 ethnicities in the nation, can have difficulties speaking local languages and understanding customs in regions far from their home. The young men said their local knowledge helps the soldiers do their job better. Musa said the vigilantes didn’t fear the extremists, even though their fighters carry Kalashnikov assault rifles and other sophisticated weaponry. Last Friday, however, the Civilian JTF members found themselves a target of a suspected Boko Haram attack. Gunmen hid their assault rifles inside a coffin and opened fire on them in Maiduguri. At least 13 people were killed in that attack, witnesses said. It’s not clear whether these civilian groups receive either the passive acceptance or the endorsement of the military now securing Maiduguri, though it would appear likely as soldiers seem to allow their movement in a city filled with sandbagged roadblocks. Lt. Col. Sagir Musa, a military spokesman in the city, could not be reached for comment as security forces have shut down mobile phone networks in the northeast as part of the offensive. What is known is that suspects recently pointed out by the vigilantes in three cases ended up dead. Two were shot and killed for “trying to escape,” a witness recently said. An AP journalist saw the bodies of eight other suspected extremists dead in a ditch after being pointed out last week by vigilantes. Human rights activists and international organizations routinely document cases of soldiers and police carrying out so-called “extrajudicial killings” in Nigeria, meaning that those pointed out could end up dead or imprisoned without charges. However, those concerns don’t bother the civilians, who continue their armed patrols. This entry was posted in News and tagged Adamawa, Borno, Chad, Civilian JTF, Niger, President Goodluck Jonathan, Sahel bordering, vigilante group, Yobe. Bookmark the permalink.